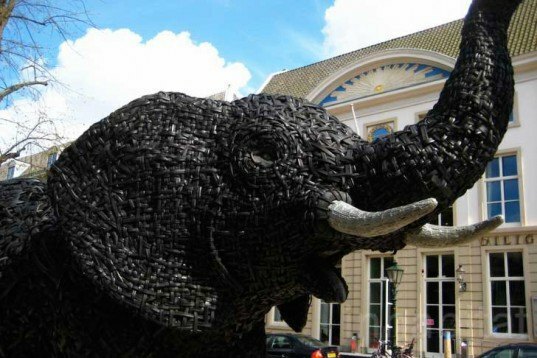 Giant yet vulnerable, this elephant made of recycled tires has been stomping around the world and now stands just outside The Hague's historical Museum Beelden aan Zee for everyone to enjoy. Created by artist Andries Botha, the sculpture is a statement on the amount of stuff we throw away and its consequences on the environment. Confident yet threatened, Botha's sustainable art is being exhibited as part of the Rainbow Nation exhibition, which is curated by Annelies Brans and reflects on the complexity and diversity of South African society. Made from woven truck tires and a galvanized mild steel skeleton, this recycled beast is taking The Netherlands by storm. Measuring 10 feet tall and 18 feet in length, it is currently on display within The Rainbow Nation exhibit of contemporary sculptures from South Africa. This extensive summer exhibition coincides with the opening of the great Nelson Mandela memorial in The Netherlands’ third largest city and home to the Monarchy. This life-size elephant is part of a herd of 17 elephants belonging to the Human Elephant Foundation, and was initially built for the 9th World Wilderness Congress in Merida the Yucatan, Mexico. After that, it has been traveling the world and has visited many Mexican, US and South African cities before stomping at The Hague’s until mid September this year. Botha’s recycled waste sculptures give out a big environmental message: more wastelands means less habitat for wildlife. Hi this is great. I represent an environmental area at the glastonbury festival (June 2013) the elephant would work very well there. Who can I contact? 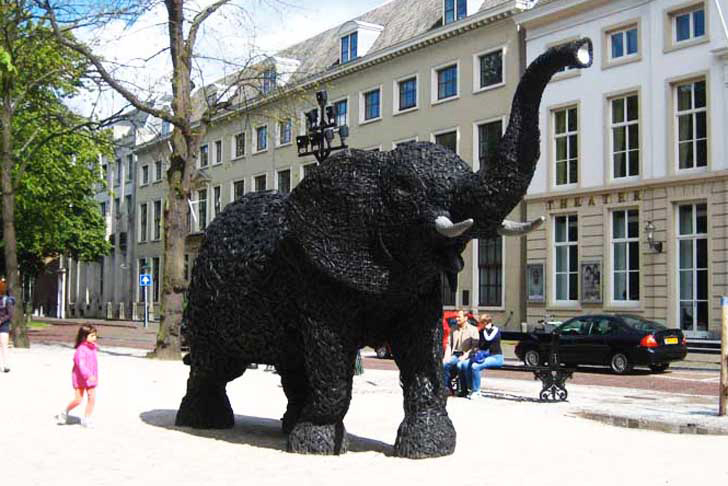 Made from woven truck tires and a galvanized mild steel skeleton, this recycled beast is taking Dutch citizens by storm. Measuring 10 foot high and 18 foot in length, it is currently on show within The Rainbow Nation outdoors on contemporary sculptures from South Africa. This extensive summer exhibition coincides with the later revelation of the great Nelson Mandela memorial in The Netherlands' third largest city and home to the Monarchy. This life-size Pachydermatous is part of a herd of 17 elephants belonging to the Human Elephant Foundation, and was initially built for WILD9 congress in Merida the Yucatan, Mexico. After that, its been travelling the world and has visited many Mexican, US and South African cities before stomping at The Hague's until mid September this year. Botha's recycled waste sculptures give out a big environmental message: more wastelands means less habitat, for us, and for the animals.